Technically robot can be define as a machine which includes various field of engineering and in general it can be define as the working partner of us in the field in all the situation whether it is in our house, in laboratory, in industries, in space and even for playing children. Now the question arises do we really need robots? Human being has some limitations regarding weather, temperature, pressure, so he is unable to work out of this limitation in those situations robots work for us, in many field like in Marines, nuclear reactor, in the deep of ocean, or to limit of space where human are helpless but robots are at work on behalf of human being. Robots are nothing but combination of some computational analysis, control system and actuators and some time with self-learning process called artificial intelligence. In robots generally we get data from the sensors attached to the system now according to these data control system decides at what angle and at which position unit’s motors has to move to reach the destination and then with the help of End-effectors robot performs its assigned work like search or picking and placing, opening the gate. This is the basic of any robot, for giving additional functionality to robot some computational part should be added to it. For example in legged robot when legs are moving then special care should be taken about the center of gravity so that a balance can be introduce for both the legs and robot can walk like a human. 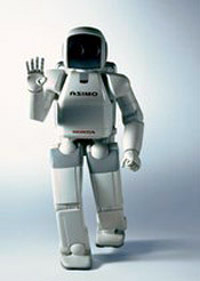 There are many companies and research institutes working in this field, giving us ultimate robots like Honda’s ASIMO “Humanoid robot” its like man made human being, PUMA The working hand, snake like robots (hyper redundant), wall climbing robots and many more. In addition, a very recent Ever-1 from Korean Institute for Industrial Technology is capable of showing expressions on her face, only the second android to do this after Japan’s Actroid. Another robot named T-Rot’s has fingers, which have a human-like sense of touch, so they can hold objects by adjusting their strength depending on the material. Think about a robot as a security guard, which can monitor your house, office and take pictures of suspicious people and intruders. On the other hand, a Firefighter robot can penetrate deep into the flames and extinguish fires at their core. All these robots are already developed and in the production line. Now days making simple robots are not a big deal, craze in this field is increasing day by day for making more complicated robots, which can do some complicated work for us. According to one research, intelligent robot market will reach US$500 billion by 2020 as the market for “intelligent” robots holds rich potential, with countries like Japan, U.S. and many European countries racing each other for the lead. There are many organizations like ROBOCON, TECHKRITI, which are organizing events and even competition on robotics. In the market you will get so many games related to robots in such games there is a given task and you have to complete the task by using sensors motors and controllers. For kids one Lego kit or Robotics invention system is available in the market by using this kit children can make their own robots i.e. own friends to play. This is fact that robots can’t take place of a human being but this is also fact that robots are creature of human mind to make human life simpler and longer. Here I would like to give brief description of very interesting robot i.e. snake robot. This type of robots are used in Search Duct inspection and maintenance of Jet engine, Bomb disarming, Medical applications because of its unique features like thread like structure, enhanced mobility, Multi functionality and extra flexibility. Now a days scientist all over the world are working hard on making complex robots for complex work, research in this field is going on the great extend. Days are not very far when robots like R2D2 like in Star Wars movie that can think, talk and move themselves will be part of everyday life. Robotic vacuum is already available in the market and people like it. Some common tasks like when we will reach to our office they will keep everything ready for us. We simply have to go and work without taking care of opening the light, AC, windows and even for the parking of your car. Robots will be there for our service. In the coming years robots will be developed and launched commercially for education, medical and military purposes.